BASKING RIDGE, N.J. – The company with the nation's most reliable wireless network today introduced the G'zOne Boulder™ – the newest Push to Talk phone that is exclusively available through Verizon Wireless. 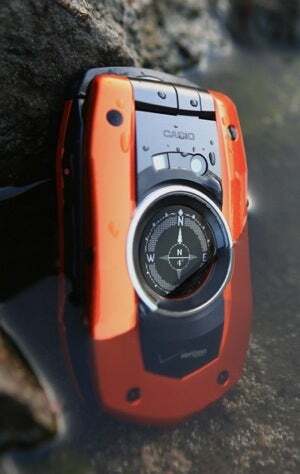 This rough and tough phone is built to military specifications to withstand shock, water and dust environments. The G'zOne Boulder provides customers with access to Verizon Wireless' Push to Talk service that uses the company's Evolution-Data Optimized (EV-DO) Revision A (Rev. A) network to ensure customers can get their jobs done quickly and efficiently. Packaged in two smart-looking finishes – black and silver or orange – the G'zOne Boulder is now available online at www.verizonwireless.com and through business sales channels. The phone will be available in Verizon Wireless Communications Stores in mid-August. Leveraging EV-DO Rev. A technology, Push to Talk from Verizon Wireless provides customers with fast two-way communication – all with the assurance of a reliable network so customers can instantly connect to colleagues and friends. Additionally, the G'zOne Boulder supports a number of productivity tools and entertainment services from Verizon Wireless including VZ NavigatorSM, Field Force Manager, V CAST Music with Rhapsody and V CAST Video. * V CAST Music with Rhapsody-capable – download music directly to the phone from a library of more than 5 million songs and get the master copy of the song on a PC free of digital rights management software that restricts how and where music can be played. Customers can also sync favorite tracks, albums and playlists from a PC. * Dimensions: 3.9" x 2.0" x 0.9"
The G'zOne Boulder is available for $129.99 after a $50 mail-in rebate and a new two-year customer agreement. Corporate discount pricing is available. In addition, customers may choose to purchase the G'zOne Boulder without a camera in silver and black, available today through business sales channels and through the company's online store. Verizon Wireless customers can add Unlimited Push to Talk to their G'zOne Boulder for $5 per month, per line to any Nationwide voice plan. For more information about Verizon Wireless products and services, visit a Verizon Wireless Communications Store, call 1-800-2 JOIN IN or go to www.verizonwireless.com. Business customers should call 1-800-VZW-4BIZ or contact their Verizon Wireless Business Sales Representative.